Soldiers of the 1st Battalion, 163rd Infantry Regiment, 41st Infantry Division, storm ashore on Insoemoar (Wakde) Island. Note canvas cover on the center Landing Craft Vehicle and Personnel (LCVP). 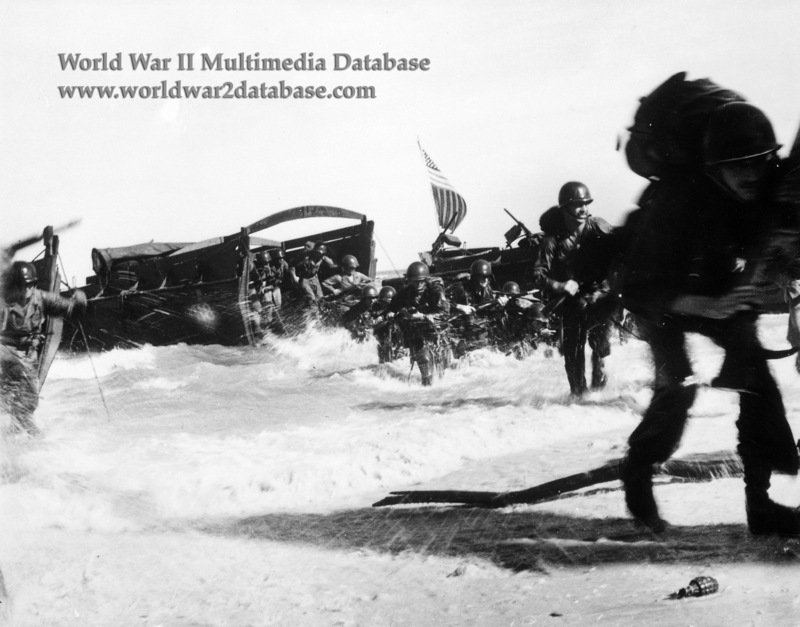 The first wave of LCVPs, Company B aboard, began to receive Japanese rifle and machine gun fire from about 300 yards (274 meters) out, but pushed on toward Wakde to hit the beach a few yards to the left of a jetty at 0910 Hours. The other three rifle companies and two M4 Sherman tanks of the 1st Platoon, 603d Tank Company, were ashore in the same area by 0925. A third tank had shorted its electrical system while loading from the mainland and a fourth dropped into seven feet of water as it left its LCM's ramp. Neither got to Wakde on May 18. All landing waves were subjected to increasing fire from Japanese machine guns and rifles in hidden positions on the flanks of the beachhead. Luckily, the Japanese, for unknown reasons, failed to use their .50 caliber and 20mm machine guns on D-Day. The Japanese garrison on Wakde Island was the 9th Company, 3d Battalion, 224th Infantry Regiment, reinforced by 75mm mountain artillery, mortars, and machine guns. The strength of this combat force was about 280 men. There was also 150 men of the Special Naval Landing Force. Miscellaneous service personnel brought the total to nearly 800 troops. After a two-day battle that ended in a suicide charge by 37 Japanese, Wakde was declared secure. The final count of Japanese casualties on Wakde Island was 759 killed and 4 captured. An additional 50 or more of the enemy had been killed on the mainland of New Guinea through May 20. In action the US Army lost 40 men killed or died of wounds and 107 wounded. Total American casualties, including naval, on Wakde, Insoemanai, Liki, Niroemoar, and the neighboring mainland through 20 May were 43 killed and 139 wounded. During the same period the Japanese lost at least 800 men. The Japanese-built airfield was already being expanded before Wakde was secure. The 163rd, exhausted, was sent to reinforce the Biak operation 300 miles away.